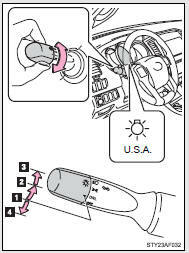 With the headlights on, push the lever forward to turn on the high beams. Pull the lever toward you to turn on the high beams. ●To make your vehicle more visible to other drivers, the front turn signal lights turn on automatically whenever the engine is started and the parking brake is released. Daytime running lights are not designed for use at night. Opening the driver’s door with the engine switch in the ACC or LOCK position will turn the headlights and tail lights off. 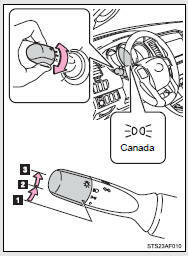 To turn the lights on again, turn the engine switch to the ON position, or turn the headlight switch off once and then back to the or position.